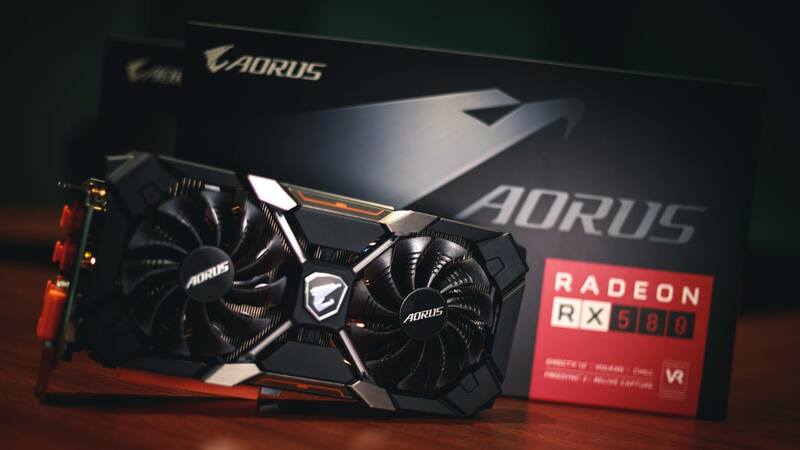 GIGABYTE expands its AORUS graphics card portfolio with the announcement of the AORUS Radeon™ RX 580 and RX 570 lineup. Powered by the third-generation Polaris architecture, the new AORUS graphics cards provide excellent power switching and thermal efficiency thanks to the GPU Gauntlet Sorting technology. Combining faster clock speeds with the highly-acclaimed WINDFORCE cooling solution and customizable RGB illumination, the AORUS RX 500 Series graphics cards together deliver outstanding performance on both gaming and style to gamers seeking a significant upgrade at a great value. The AORUS RX 580 XTR is the top-of-the-line model that boasts the WINDFORCE 2X cooling system, featuring dual 100mm fans paired with 4 composite copper heat pipes which directly touch the GPU to keep the card cool under load. Excessive heat from GPU can also be dissipated through the back side with the advanced copper back plate. The airflow is enhanced by the unique blade fan with an alternate spinning mechanism for minimal turbulence. The fans are also semi-passive for keeping the operation silent along with a Fan Stop indicator. The card is backed by a 6+2 power phase design for greater overclocking capability and reliability, reinforcing higher, stable boost clocks at heavy load. The look follows the sharp and agile aesthetics of AORUS with the angular shroud design highlighted by the RGB cross. Gamers could enjoy maximum freedom to choose the right scheme for their gaming rigs with RGB Fusion. The graphics card also comes with a metal back plate, keeping a clean look, whilst adding rigidity to the structure and protection of delicate PCB components. Available in 8G and 4G of GDDR5 memory, the AORUS RX 580 is ready for VR and smooth gaming at 1440p. The WINDFORCE-cooled cards are equipped with dual 90mm fans and 4 composite copper heat pipes in direct touch to the GPU. At the rear, the advanced copper back plate further dissipates excessive GPU heat, providing an all-around cooling solution. For gaming in silence, the alternate spinning blade fans optimize airflow with minimal turbulence and noise. The fans remain off when the GPU is under light load or idle. The Fan Stop indicator allows the users to monitor the fan status while gaming. The AORUS RX 580 graphics cards bring a personal touch to PC builds with its fully customizable RGB Fusion by using AORUS Graphics Engine. The cards are also reinforced with a sleek-looking metal back plate that adds rigidity and protection to the structure. Built for maximum 1080p gaming, the AORUS RX 570 graphics card features the dual-fan WINDFORCE 2X system similar to that of the AORUS RX 580 with the advanced copper back plate, counter-rotating fans and semi-passive cooling to keep the temperature in check while remaining silent for uninterrupted gaming sessions. With RGB Fusion, gamers could customize the right scheme for their gaming rigs that defines their unique style. In addition to the AORUS-branded offerings, GIGABYTE also releases Radeon™ RX 580 and RX 570 Gaming series graphics cards. These cards are coupled with the WINDFORCE dual-fan cooler and RGB illumination, making the Gaming series a smart choice for budget-conscious gamers looking for an affordable upgrade to high-quality gaming or even virtual reality.